The biggest disaster in terms of fatalities in the energy industry was the 1975 Banqiao Dam failure in China which killed over 170,000 people. However this is not the only hydroelectric dam failure which has cause loss of life and major damage in the surrounding area. The accidents in this sector are rare but when something does go wrong then the consequences are usually fatal. Planners need to take a lot of geological and environmental issues into account when they plan building new hydroelectric plants but sometimes the events can’t be predicted. How extreme events should be predicted in building these dams? Permalink Submitted by RossWinter on Thu, 2012-10-11 15:28. Hydropower incidents are usually cause by 3 main factors; poor planning, unpredictable natural events or equipment failure.Sometimes developers of new dams don’t take all geological factors into account, this was the case in the 1963 Vajont Dam disaster in Italy. It was cause by a tidal wave overtopping the dam and flooding the valley below, killing around 2500 people. The wave was cause by a the water in the dam eroding the rock, causing a landslide and this created a massive wave, which didn’t destroy the dam, but swept down the valley completely destroying several towns on its way.The Banqiao Dam was cause by a typhoon which cause the areas yearly precipitation levels in a few hours which no-one would have predicted happening. Another dam failure cause by unpredictable natural causes was the Kyzyl-Agash dam failure in Kazakhstan. In 2010 the dam burst due to increased rainfall and early snowmelt due to unseasonably warm weather, this incident killed at least 43 people but some figures quoted are over 200 people. Could these deaths have been predicted, it is hard to tell because of the severity of the water rises over prediction. It is hard to make previsions for events on this scale without spending millions more than needed. Permalink Submitted by Fungisai N Nota on Sun, 2012-12-09 15:10. Permalink Submitted by Fungisai N Nota on Sun, 2012-12-09 15:12.
and hence leading to the deaths of many people. Permalink Submitted by Maria Christou on Fri, 2012-10-12 16:43. Permalink Submitted by OKECHUKWU CHUKELU on Tue, 2012-10-16 10:24.
which obviously costs more money. Permalink Submitted by Richard Sedafor on Fri, 2012-11-16 21:30. Maria, even though Dams do not produce direct emissions like coal, oil and gas plants, the production of materials used in the construction of these dams and the construction phase itself produces emissions. Therefore if you analysing the Life-cycle of the Hydroplant you will realize that it is not soo clean as it may appear. With regards to deaths per KWh energy produced, Hydropower is relatively safer than Coal, peat, oil and gas sources of energy. The death per KWh for Hydropower is estimated at 1.4 world wide. More alarming is the social impacts that are associated with Dam construction and its related activities. Displacement and its associated risks are a concern to every society. WCD(2000) reports that about 40 to 80 million people have been displaced as a result of dam construction.. This displacements often have the consequence of impoverishment, hunger and even death. Who are we preventing effects of greenhouse emissions from? Isnt it humans and wild life? If it is, then hydropower is not soo safe looking at it in totality. Msc Oil and Gas Engineering. Permalink Submitted by OKECHUKWU CHUKELU on Tue, 2012-10-16 10:22. Permalink Submitted by Harrison Oluwaseyi on Tue, 2012-10-16 10:58.
electricity for domestic and industrial uses. water to drive a turbine and the generator. field that has changed the dams are designed and located. Station, 1fatality, cost $100million. (Destruction of the plant). SAFETY RSIK MANAGEMENT FOR HYDROELECTRIC PROJECTS"
INTRODUCTION TO HYDROPOWER CONCEPTS AND PLANNING"
Permalink Submitted by JOHN BOSCO ALIG... on Tue, 2012-10-16 17:28. Like my colleagues have already said,hydro power is one of the safest and reliable renewable source of energy unlike other energy sources.It may not be 100% safe but as Harrison has already noted,most of the accidents associated with hydro power are due to equipment failures and poor maintenance practices and these should be blamed on human negligence/errors during the design,construction and maintenance of hydro power stations.I still beleive that it is very possible to acheive maximum safety in hydro power stations if proper safety procedures and regulations are adhered to.About the flooding that Okechukwu Chukelu is talking about,i think this can be avoided by a proper design of the dam and i dont see any carbondioxide emissions coming out of a hydropower plant because water just runs through the turbines,it is not effluent neither is there a combustion process however they do have some impact on the environment through damming ,diversion and or hydro-peaking (1). Since dams and weirs interrupt the flow of streams ,they act as barriers restricting fish from reaching their spawn areas especially salmon.There fore dams affect the feeding habits of fish.Also the natural transport of sediments is altered (1).Other impacts of hydro power is the change of land scape and creation of reservoirs that act as breeding places for mosquitoes which cause malaria to humans. Most of the above safety and environmental concerns can however be mitigated or avoided by ensuring proper planning before the construction process of the dams. It should however be noted that Hydro power plants are even much safer than the other renewable sources of energy and present a very bright future. Permalink Submitted by sreehariprabhu on Tue, 2012-10-16 18:48.
with rapidly moving, dangerous waters. So it is important to set signs where the water may rise and people should take care of going beyond the signs for safety. Other safety measures include the design of the dams. These dams should be safely designed by considering all loads and stresses. Even after the construction is complete, it is very important to frequently inspect the dams. Often, it is the lack of inspection of dams which turns to be a factor leading to unfortunate incidents. Permalink Submitted by Andreas Kokkinos on Wed, 2012-10-17 13:21. Permalink Submitted by faizakhatri on Thu, 2012-10-18 07:19. Permalink Submitted by Igwe Veronica I... on Thu, 2012-10-18 17:09.
water. The water used to for hydropower generation can also be reused. Permalink Submitted by Craig Donaldson on Sun, 2012-10-21 06:43. I disagree, even if the design of a dam is controlled and monitored closely it cannot have zero impact on the environment. The very fact that you are creating a dam means that a lake will form behind it and is often overlooked when people think about hydropower. This new lake has to form on something which could be land used for farming or effect whole ecosystems upstream. The river which the dam is placed on will be affected and as mentioned before fish, which use the river as a migratory path will be substantially disturbed. However, it is unlikely these days that a dam would be placed someone which would require a large relocation of a human population. I believe this striking picture of the Merowe Dam in Sudan highlights the problem. Permalink Submitted by Marinos Ioannou on Thu, 2012-10-18 07:33.
facilities has to know and understand the risk issues that he/she may deal with. Permalink Submitted by Trevor Strawbridge on Thu, 2012-10-18 07:55. Permalink Submitted by Frixos Karletides on Thu, 2012-10-18 18:45. Permalink Submitted by Angelos Hadjiantoni on Sun, 2012-11-25 09:44. I totally agree with you that care must be taken when constructing dams which is the case for every operation in the power industry. Moreover studies should be carried out regarding possible side effects. But I would like to add to the discussion the fact that hydropower is not the dangerous energy source that some people present it to be. To support my opinion I am including here a figure taken by the “Sunstainable Energy- without the hot air” by JC McKay. it is very low compared to conventional sources. in order to minimize some of the disadvantages and because it is more practical (even though more costly regarding to output). Permalink Submitted by Kelvin Osaro on Sat, 2012-10-20 10:34. The environmental impacts caused by the construction of dam can be through land loss due to the filling up of reservoirs leading to flooding which is the main impact on the local population, especially when agricultural land or house property is affected. This can lead to resettlement and compensation schemes, which is a major issue in the hydropower context. More so, businesses or industries are affected by any alteration of water bodies, landscape and habitats that occurs in hydropower generation schemes either through negative or positive effects. In the large hydropower scheme, health issues are of great importance in tropical regions such as South America, Africa and the Caribbean, it has been reported that the existence of reservoirs at hydropower plants have triggered diseases such as malaria, bilharzias (schistosomiasis), and other mosquito-borne infections. More so, biological toxins such as methyl-mercury or algae can be observed in most large reservoirs which are also a further problem to health. Finally, resettlement and loss of habitat and livelihood leads to mental health issues when resettling people thereby leading to individual depression to violence and social breakdown. This is a major issue for reservoirs in that, natural transported sediments alter the lifetime of most hydropower schemes due to the head ponds or reservoirs being filled up with inflowing sediment that causes flooding or reduction in power generation. Also causes existence of fishes impossible or creates habitat too rough for most river ecosystems and effects of low flows and hydro-peaking downstream. Weather conditions such as snow, rain, fog and ice can make or cause visible signs of hazardous areas during daytime more dangerous during the night when the visibility of these hazardous areas cannot be seen due to bad weather conditions. More so, wind gust is also an issue in that, the higher the wind the harder for boaters to control the boats thereby, making it difficult to react to warning signs when they are forced into hazardous locations . Permalink Submitted by Soseleye F. Ideriah on Sat, 2012-10-20 13:05. Yes, hydropower utilises an abundant and renewable source in generating electricity but like all major forms of energy in use, it has its shortcomings. When these dams fail, they fail with devastating effects; the Banqiao reservoir dam despite being designed to withstand large floods, failed due to flooding, and eventually claimed an estimated 171,000 lives, destroying the homes of 11 million people in the process . Beyond the dangers of hydropower already identified in earlier posts on this topic, this energy generation option also creates certain environmental challenges. Hydropower dams are very large structures, requiring a vast land area and plenty of water. Building a new dam often leads to relocation of established settlements. Dangers posed to marine life are a major concern as dams may cause obstruction to fish migration and affect their populations . Hydroelectric power plants have been known to also change the water temperature and river flow, causing harm to native plants and animals. Safety is closely linked with environmental issues and in my opinion, negative effects on animal life are additional safety concerns. Permalink Submitted by Kelvin Osaro on Sat, 2012-10-20 19:38. In general, it is important to inform the public of any hazards that can exist close to hydropower projects or any project in order to ensure safety awareness of possible risks. This public awareness can be done through company literature, recreational brochures, television or radio announcements, video tapes, advertisements and newspaper articles . More so, showing warning signs were high risk is to be avoided at any project. Hazardous areas require warning devices such as: danger and warning signs, audible warning devices, power communication lines, canoe portage signs, beacons and strobe lights, buoys, verbal warnings, and lights and illumination. These devices are required where essential to warn the public of hazardous areas like powerhouse intake areas, spillways, tailraces, and other hazardous areas and conditions . In most cases, altering procedures for safer project operation can improve safety conditions at a project. For example, modifying gate opening procedures may reduce or eliminate sudden surges in flows or may be used to direct flows to less hazardous areas. More so, imposing or changing ramping rates for generating units can prevent sudden increases in tailwater levels. Nevertheless, it is vital for all project operators to encourage the review of operating procedures as they affect public safety and to ensure that any necessary developments are consistent with good public safety practices and the primary purposes of the project . Escape devices serve as a means of escape for people who are otherwise or unable to get out of hazardous waters. These devices are such as safety ropes, life preservers, escape ladders, suspended cables and escape nets . In general, in order to ensure the safety of the public against hazardous areas, physical restraining devices should be in place. These are boat restraining barriers, fences, guardrails, natural barriers, trashracks, debris deflector booms, and other similar devices . Permalink Submitted by FELIXMAIYO on Sun, 2012-10-21 12:52. One of the disadvantages is that it interferes with the aquatic ecosystem because dams have to be constructed; this leads to large scale destruction of the aquatic life. One the turbines have installed there is a chance of fish and other water animals entering the penstock and ultimately the power generation where they will be killed. There is the disruption of the surrounding areas :plants and animal life tend to do well along the fresh flowing rivers and construction of the dam will force them to move to a different place, also the trees along the rivers will have to be cut down to give way for the dam. Permalink Submitted by YAKUBU ABUBAKAR... on Mon, 2012-10-22 03:09.
every year which consistently weaken the structural strength of the dam. emission which is detrimental and unsafe to the environment. Permalink Submitted by chukwuemeka uzukwu on Wed, 2012-10-24 08:27.
emissions, no waste and no thermal degradation of water. existing waterfall or the creation of a reservoir. Permalink Submitted by Omololu Oyebola on Sat, 2012-10-27 06:04. Hydropower’s renewable nature, little or no greenhouse gases and other noxious emissions makes it advantageous over other forms of energy generation. At the same time, hyropower has negative effect on the environment, and some of the safety issues are earthquake vulnerability, wildlife and fishes get affected, tail risk and dam failure. Hydropower stations situated close to settlement areas can expose people to flooding, the building of large dams can cause serious geological damage. For example, the building of the Hoover Dam in the USA triggered a number of earth quakes and has depressed the earth’s surface at its location. About 1,500,000 have been relocated away from the Three Gorges Dam. Dam development can have adverse effect on the quality of water in that region in several different ways, destroying the natural vegetation can result in soil erosions and land slide, which can cause a buildup that of sediments that can clog up the streams. In summary, safety problems associated with hydropower are, area exposed to flood, ecosystem will be altered, and displacement of human settlement. Safety in Hydropower can be optimised. Permalink Submitted by Deinyefa S. Ebikeme on Sat, 2012-10-27 10:29. People always come first in the "cause and effect scale" of any projects and when they are affected from such projects negativity especially in the event of any accidents to a great magnitude they tend to castigate and tag it as unsafe sometimes ignoring its initial benefits (ie 1975 China Banqiao Reservoir Dam failure with 26,000 dead from direct flooding, 145,000 dead from subsequent famine and epidemics, 11 million homeless. Caused loss of generation, dam failed by overtopping. Russia 2009 Sayano-Shushenskaya hydro accident, 6 GW power generation loss, 75 fatalities, due to turbine failure etc). It's true that hydroelectric power generation has affected humans over times going by the records of hydroelectric power failures were several lives had been lost but its benefits cannot be neglected (renewable source, zero green house gas emission compared to fossil fuel plant, environmentally friendly to an extend etc). Majority of these accidents experienced from hydropower had to do with human negligence to boardly and properly tactle the area of design stage flaws, apply viable technology to withstand the energy in turbulent flowing water and maintenance culture inactiveness for these plants. This falls have now been taken into full considerations which includes enivronment impacts such as natural disasters with dam now constructed to "safely" withstand earthquakes up to 8 on the Richter scale and also the ecosystem of aquatic mammals in such regions and are been checked by various legislative bodies. Permalink Submitted by Ekaterina Pavli... on Mon, 2012-10-29 06:25. I am surprised at any contribution on this topic that can be seen as positive and I’d suggest that to take a look at Hydro Electric Power we have to look at this in a global context, as to the greater extent ingenious peoples that live in the location of a Hydro Electric Dam, live in a nightmare scenario. There are considerable health impacts for the people living in the location of a hydroelectric dam such as the spread of malaria, hepatitis, schistosomiasis and river blindness. More often than not frequent engineering and safety problems as these projects are mostly funded by the world bank; dams thrown up by companies keen to maximize their profits on what is often seen as ‘money for jam’, with little regard to quality and safety. Dams with shoddy construction are easy targets for saboteurs and given that these projects are often undertaken in less politically stable counties they become pawns in the game of political control. Also, the construction of a hydroelectric dam often means the destruction of unique local natural resources such as historical archeological sites. Unfortunately, this never deters the financial backers or construction companies from moving ahead with these projects, which also usually involves the relocation of the indigenous peoples and destruction of local wildlife. The consequences of building a Hydro Electric Power Station are far more disastrous than any potential benefit. Permalink Submitted by SON CHANGHWAN on Mon, 2012-10-29 20:54.
downstream will be destroyed and cause a damage in fishing industry. Permalink Submitted by Ekaterina Pavli... on Tue, 2012-10-30 05:30. Chang Hwan is right, Hartbeespoort Dam is a classic example of regime failure, with two million liters of sewage (some of it raw) flowing daily down the Jukskei River into the dam, all done ‘legally’, but this is not the worst of it; the Pelindaba nuclear plant is licensed to routinely dump vast quantities of nuclear waste into the Crocodile River, just above the dam; it’s been reported that radioactive liquid waste has been released into the Crocodile River at the rate of over half a million litres per day! The Hartbeespoort Dam is a major source of local drinking water, is massively polluted and yet the authorities in control deny any concern. Permalink Submitted by Ber_Mar on Thu, 2012-11-01 21:39. Altough most of the dear collegues seem to adress the safety or not of the operation of a water dam, i would like to adress a diferent matter which is related to the construction phase of hydroelectrical power plants. Due to their specific construction method and the need to divert water streams or not to produce a barrier for the forthcoming artificial lake to be sustained, these type of construction can be in fact "tricky". In Portugal a Hydro Power plan is beeing set into motion with the construction of 15 to 20 diferent hydropower plants. Even considering the risk managment and taking into care all the pro active preventive mathers, the earthworks stability the level of uncertainity related to soil mechanics is so big, that accidents end up happening. From the beginning year have died 3 people just in one accident and then other 2 in another. Permalink Submitted by Elvis.E.Osung on Sun, 2012-11-04 14:13. Hydropower can be considered fairly green because of the near absence of carbon emissions. This does not entirely imply that dams are safe. Identifying the hazards and assessing the risks involved in Hydropower includes considering the environmental impact of both the construction and operation phase, besides affecting aquatic habitat in the construction phase, in the operation phase dams are subject to the risk of collapse, some times to prevent failure of dams as a result of increased water levels, the gates are opened which causes flooding among people living downstream. Permalink Submitted by Kii Cajetan Barisi on Mon, 2012-11-05 18:40.
to the curtailing of major floods and a flow range restricted to the turbine discharge capacity. inter-annual variability may be low. when operating to meet baseload demand. the erosive capabilities of continuous larger than natural baseflows for baseload operations. the degree of seepage-induced erosion that may occur when the power station turns off. otherwise if the power station has not been on long because the banks will not be as saturated. structural stability to river banks. possibly bed movement under rapidly varying flows. may provide more frequent opportunities for migration through these gorges. Permalink Submitted by Kii Cajetan Barisi on Mon, 2012-11-05 18:48.
development, and the analysis of its impacts. uprooted and vulnerable populations dispersed. human population over the last 3 generations. or scarcity. By 2025, the figure will rise to 50 countries and 3 billion people will be adversely affected, the majority in least developed countries. while its quality is declining due to human abuse. frameworks for integrated water management. Permalink Submitted by Kii Cajetan Barisi on Mon, 2012-11-05 18:51.
fact, as it may be perceived as an extra "burden"
thermal power generation actually "depletes"
used - coal, oil, gas - are not perceived as lifesustaining resources. Hydropower, Safety and Risks involved. Permalink Submitted by Elle Allswell David on Tue, 2012-11-06 19:12.
which generates about 960 megawatts of electricity for the country. aspect should also be taken care of. Permalink Submitted by Ryan Grekowicz on Thu, 2012-11-08 15:22. After scrolling down through my fellow classmate's posts, there was one environmental impact that wasn't mentioned. I grew up in the Northwestern part of the United States where there are many dams that were constructed to provide electricity to the region. The once mighty Columbia River has now been reduced to a several hundred mile long reservoir as a result of the numerous number of dams, which is sad, but has no measurable impact. The one impact it did have, which was a very big deal in that part of the United States, was that the dams nearly decimated the once very strong salmon runs. (FYI- salmon are a type of fish that live their first year in a river, then migrate to the ocean, where they live for a couple years before returning to the same river they were born in, to spawn and then die) The salmon play a very important cultural and economic role in the region, and it was a huge blow to both when their populations started decreasing. The electric companies attempted to mitigate the issue by installing "fish ladders" which allowed the salmon to swim around the dam, and they also started allowing additional water over the spill way when the baby salmon were migrating downriver so that they weren't chewed up by the turbines. These measures have allowed it so the salmon haven't become extinct, but their populations are so low that fishing isn't allowed in many regions. Besides the salmon issue, I know of no other problems with hydroelectricity production; therefore, I would say unless there is a similar environmental impact, then hydroelectricity is a terrific option for renewable energy. Permalink Submitted by Siwei Kang on Thu, 2012-11-08 15:45. It is obvious that hydropower is one of the safest and most reliable energy. Except flawed design and poor consturct, it could be operated safely, at least its lower FAR and AFR compared with other industry, like oil and gas. However, should we really encourage to build more hydropowers? Personally speaking, the risk of hydropower is the biggest problem. One of the risks need to be considered is the regional ecology could be affected after hydropower commission. Take China for example, during the past five decades, more than 230 large and medium-sized hydropower stations have been built. The Three Gorges Hydropower Station, total installed capacity of 18.2 million kilowatts, is now the world's largest hydropower station. After commission, it provides large amount of electricity generation and largely eases energy shortage. However, it also significantly deteriorates the ecological environment along the Yangzte River, even the climate in China. From 2008, the Three Gorges Hydropower as-built two years later, the areas along the Yangzte River experienced frequent abnormal climates. Due to damming, the Dongting and Boyang lakes, which is located in the dwonstream of Yangzte Rizer, has already dried up. It is said that the WenChuan earthquake happened in 2008 was induced by the Three Gorges hydropower. Another risk is the terror attack or war. If the dam is exploded by terroists, the downstream could be flooded and all people in that region will die. The effect is devastated. On the other hand, if there is a war between countries, the dam could be the first attack target. Although the destrust of dam due to war or terror attack has not happened, it is a big risk. Nowadays, with the hydropower construction is increased, it is better to know its potential risk firstly. Permalink Submitted by Ekaterina Pavli... on Fri, 2012-11-09 23:48. With the majority of the world’s rivers dammed at some point, we are coming to the point where room for additional hydro plant is getting more and more limited. Wouldn’t it be really nice to allow the environment some space; this desire to plant a major earthwork across every available damming location to supposedly meet the power needs of this or that industry really isn’t worth it. Not only the major environmental and social impact that surrounds the building of the dam in the first place, but once built we’re left with an environmental mess that costs millions to try to maintain; all for what is in most cases, at the end of the day a source of ‘top-up’ power for periods of peak demand and usually something that could easily have been sourced by either upgrading an existing turbine or expanding existing power stations close to the industries that required the power in the first place. With the tight restrictions on the operation of fosil fuelled power stations (scrubbers in cooling towers, etc.) and the even tighter constraints that will be applied year after year, looking to the future the case for supposedly 'green' hydro falls away drastically. Permalink Submitted by Ekaterina Pavli... on Sat, 2012-11-10 00:58. Anyone who supports the building of more dams should try to read the book, Deep Water: The Epic Struggle over Dams, Displaced People, and the Environment, by Jacques Leslie. In his book Leslie points out that as far as resources go, Water is going to be the Oil of the 21st Century. We need to carefully think out our water strategy for the future; currently most British water companies cannot go a week without rain before crying ‘drought’, perhaps being facetious here but the point is that there is little regard for the long term future for the water supply in most countries and the sooner we look globally at this issue and come up with sustainable programs the better the future prospects for the human race; building more dams is not the solution! •The United States has come to realize that dams are not an unmitigated blessing and now are dismantling dams that don't provide much benefit. •Yet, the World Bank is still financing dams like the Three Gorge Dam in China despite the huge cost to the people and the environment. Permalink Submitted by t01sik12 on Sat, 2012-11-10 10:47. Developing the hydropower potentially offers many challenges, and pressures from some environmental action groups over its impact has tended to increase over time. Hydropower throughout the world provides 17% of our electricity from an installed capacity of some 730 GW, making hydropower by far the most important renewable energy for electrical power production. Hydropower stations situated nearby residential or settlement areas can expose people to flooding, the building of dams around the settlement areas can cause serious geological damage and also affect water quality. Permalink Submitted by xingyuan.fu.12@... on Mon, 2012-11-12 18:18. Hydropower Hydropower system uses rivers and lakes that have gravitational potential energy of water, to transform into kinetic energy of the turbine. Then, through the turbine rolls, to promote the generator to produce electricity. Generally, we often consider it as renewable energy as it is clean and inexhaustible. However, in my view, this kind of energy is double-edged sword. there are also some disadvantages which will lead to environment pollution and other issues. Consequently, there are lots of protential risks in this technology. The experts just tell the public how impossible of the risk become disaster. However, when the catastrophe really happen, nobody can image the horrible results. Permalink Submitted by Bassey Kufre Peter on Wed, 2012-11-14 07:25. My colleagues have spoken intensively well on what hydropower and its mode of generation is all about. But it will interest us to know that Hydropower accounts for 16 PERCENT of global electricity consumption, and 3,427 terawatt-hours of electricity production in 2010, which continues the rapid rate of increase experienced between 2003 and 2009. Hydropower is produced in 150 COUNTRIES, with the Asia-Pacific region generating 32 PERCENT of global hydropower in 2010. Statistics also revealed that CHINA is the largest hydroelectricity producer, with 721 terawatt-hours of production in 2010, representing about 17 PERCENT of domestic electricity use. The cost of hydroelectricity is relatively low, it makes it a competitive source of renewable electricity. Also giving room to developing countries to generate their power. Considering the unending list of benefits of hydroelectricity, and also from its mode of generation already talked about by my colleagues and comparing its safety relative to other sources of power generation, I categorically affirmed that Hydroelectricity eliminates the FLUE GAS EMMISSIONS FROM FOSSIL FUEL COMBUSTION, including POLLUTANTS such as SULFUR DIOXIDE, NITRIC OXIDE, CARBON MONOXIDE, DUST, AND MERCURY IN COAL. Hydroelectricity also avoids the hazards of coal mining and indirect health effect of coal emissions. Comparing it with NUCLEAR POWER, hydroelectricity generates no NUCLEAR WASTE, has none of the dangers associated with URANIUM MINING, nor NUCLEAR LEAKS, Unlike uranium, hydroelectricity is also a renewable energy source. Comparing it with Wind Farm, hydroelectricity power plants have more predictable load factor. If the project has a stage reservoir, power can be generated whenever it is needed. Hydroelectricity plants can be easily regulated to follow variations in power demand. With the right application of Goal Setting Legislation, the risks in Hydropower are reduced to as low as reasonably. Permalink Submitted by Sineenat Kruennumjai on Thu, 2012-11-15 03:59. Hydropower is the power comes from the extraction of the energy of water cycles, for example the energy from water falls from dams. Hydropower can produce renewal energy by does not require any fuel, and also does not directly emit any greenhouse gas. So, this technology is seen to be an environmental friendly resource. But it is still have some hidden risks, such as the failure of the Banqiao Dam in China. This accident killed more than 171,000 people and made almost a million of people to be rendered homeless. The cause of this accident might be the quality of constructions. The quality of materials for construct dams have to be of very high, because any breakage in dams can create very large scale of damage of plant, human, and animals. Moreover, the location which will be constructed dams; it should be where abundant quantity of water is sufficient high. This is because when the water level is significant changed, such large quantities of water can cause flooding and disturbing natural flora and fauna. Permalink Submitted by nina yari on Fri, 2012-11-16 08:27. Hydropower energy uses water to produce energy. So it is renewable,clean and with no greenhouse gas emission. In addition, it has alot of advantages and it is inexpensive way of energy generation.But it has some dangers on marine species and disturbs ecosystem. First, fish may be killed in turbines. Second,Installations are like barriers for their migration. Last of all, supersaturation of air may cause problem for their lives. It is patently clear that the most significant risk of hydropower energy is the failure of dams as we have experienced it alot from the time hydropower has started to generate energy. It can pose risks to the people live nearby since the failure of dam causes flood. It comes to be be more hazardous when the land is likely to have seismic activities. In order to make hydropwer risk issues more tangible, pay heed to an example. Sayano-shushenskaya dam is the world's six-largest hyropower plant which is located in Russia. It has had four accidents in 1979, 1985 1988 and 2009 respectively. In the last accident 75 were confirmed dead. Permalink Submitted by Oluwasegun Onasanya on Sat, 2012-11-17 18:01.
waste and no thermal degradation of water. The creation of hydropower usually requires the diversion of the water at an existing waterfall or the creation of a reservoir. The diversion of a waterfall may not cause problems as the water is eventually released to the same water course. 1. The possibility of flooding the surrounding ecosystems. 2. There is likely going to be impediment for spawning fishes and other aquatic creatures. 3. There is the issue of methane losses from decomposing drowned vegetation. 4 The hydrodynamics of the lower reaches of rivers could be changed. in floating debris and conceal hazards. Diving or boating can be dangerous. property damage and a threat to human life. 1. How is hydropower safe. www.wikianswers.com. Permalink Submitted by Liu Yishan on Sun, 2012-11-18 11:12. There are about 90,000 dams in China including the world's largest power station in terms of installed capacity (22,500 MW) - The Three Gorges Dam. It has been a controversial topic since the beginning of installation both in China and the world. The dam not only flooded archaeological and cultural sites and dislocated about 1.3 million people, but also is causing significant ecological changes, including an increased risk of landslides. The dam locates on a seismic fault. According to the current research, 80% of the land in the area is experiencing erosion, depositing about 40 million tons of sediment into the Yangtze annually. Because the flow is slower above the dam, much of this sediment will now settle there instead of flowing downstream, and there will be less sediment downstream. Some hydrologists expect downstream riverbanks to become more vulnerable to flooding. Shanghai, more than 1,600 km away, rests on a massive sedimentary plain which depending on the arriving silt to strength the bed. If the arriving sediment becomes less, the city may have more risks of inundation. Benthic sediment buildup causes biological damage and reduces aquatic biodiversity. The erosion causes a number of landslides which may lead to earthquakes. The people and property downstream would be in dangerous. Therefore, the risk management of dam is in demand to monitor the safety of dams. Permalink Submitted by Giorgos Hadjiel... on Mon, 2012-11-19 09:53.
might swim towards them and die. Permalink Submitted by eddy itamah on Mon, 2012-11-19 19:38. The process of capturing and turning the energy of flowing water into electricity is called hydroelectric power or hydropower. This process of exploiting the renewable energy inherent in flowing water is not without its safety issues. One of the environmental impacts of hydropower are related to interventions in nature as a result of damming of water, change water flow and the construction of power lines and roads. Nevertheless, this process of electricity generation by hydroelectric power plants can thus affect fish by distorting their complex interaction between the numerous physical and biological factors. Since fish habitants are shaped by physical factors such as water level, water velocity and shelter and access to food, draining would be completely devastating to these aquatic bodies. The Other safety issues with hydropower is subdivided into various hazardous level relating to risk factor. - The presence of inherent engineering hazards such as injurious gases and toxic dust. Level 2 risk is electric shock and serious impact from equipment and material handling and fire. Permalink Submitted by eddy itamah on Mon, 2012-11-19 19:55. - To ascertain and estimate the level of hazard of the accident which may take place at the various works of the hydropower projects, based on the risk factor which may cause accidents. - To carefully scrutinize and prioritize the most appropriate safety programs with the allocated resources through the specification of the relevant weight of each safety program for the construction safety of the hydropower project. Permalink Submitted by Ernest Appiah on Wed, 2012-11-21 18:23.
do not lead to thermal degradation of water. the displacement of local people. human life. The good news is that the risk of a dam failure is extremely small. Therefore hydro power cannot be said to be completely safe in this respect. Permalink Submitted by Keqin Chen on Thu, 2012-11-22 17:13.
still should be focused on. downriver settlements and infrastructures in numerous dam failures in human history. animal migration, destruction of vegetation, disrupting the ecological balance. Permalink Submitted by Maxwell Otobo on Sat, 2012-11-24 20:45. Hydropower, a form of energy and renewable source is considered as being safe to the environment as there are no site air emissions, no waste and no thermal degradation of water, in other words no land, air or water pollution. But how true is this?? There are a number of environmental issues associated with this form of renewable energy. While hydropower generators cannot be linked to greenhouse gas emissions, the operation of the generator, the hydropower dams and reservoirs can have other environmental impacts. Dams built to create reservoirs do obstruct migration of fishes to their upstream spawning areas. Reservoir & operation of dams can lead to a change in natural water temperature, flow characteristics, chemistry and silt loads, all of which causes significant changes in the ecology (living organisms and the environment) and land form of river upstream and downstream. These may affect plants and animals. Reservoir may also lead to flooding of natural areas and cause the relocation of people. Carbon dioxide and methane which are greenhouse gases may also form in reservoirs and be emitted to the atmosphere, though the amount of GHG produced from hydropower plant reservoirs is uncertain. Hydroturbines are known to injure and kill fishes that passes through the turbines to spawning grounds or to the ocean. For example, in the columbia river situated along the Orejon and Washington, fishes (salmon) must upstream to their spawning grounds to reproduce but the dams along the river is a major obstacle for them. Although an approach known as 'Step-up' has been constructed in place around the damn to the spawning area upstream to fix this problem. While hydropower is an attractive alternative to fossil fuels, the industry/technology must overcome several obstacles related to the building costs, environmental impact and displacement of people. Permalink Submitted by Angelos Hadjiantoni on Sun, 2012-11-25 09:03.
and the safety and reliability issues related to their operation. Dam failures are one of the major risks associated with hydropower. Now according to Ramage, in the US for instance even though there are 80000 dams, only the 2400 of them are actually used for hydropower. As a result even though dam failures have happened in the past a cost a lot of deaths (35 major dams failures) only 5 or 6 have to do with hydro power. Since dams are used for many other reasons except from hydropower, someone might wonder is it worth to have dams at all? I think that the answer to this is quite obvious. Now another risk which is more hydropower focused are the plant failures. The most recent plant failure at Sayano-Shushenskaya power station in Russia caused 75 deaths and a lot of pollution. stated that all the turbines were unfit for operation due to poor maintenance and age. So once again the blame for the disaster goes to the human factor. Source : Ramage,J., Hydroelectricity. In: Boyle, G., ed. 2012 Renewable Energy: Power for a Sustainable Future, 3rd Edition, Oxford University Press. Chapter 5. Permalink Submitted by Zhou Weiwei on Mon, 2012-11-26 16:43.
done, the feasibility of hydropower station could be determined eventually. Permalink Submitted by Tianchi You on Mon, 2012-11-26 19:12. Permalink Submitted by Kyeyune Joseph on Wed, 2012-11-28 07:26. Impediment to marine life and other ecosystems due to reservoir inundation (rise in water volume and flow velocity) is one of the safety issues of hydropower. In many cases, migration between upstream and downstream is limited. This has negatives impacts especially reproduction of certain marine species. Methane and carbon dioxide emissions from reservoirs due to deeper water and slower flowing rates as well as flora and fauna covered up in huge water reservoir. Effect of these gases in relation to global warming is well known. Flooding of large reservoirs upstream especially in rainy seasons when river banks over flow, can put safety of those nearby at a risk submerging farmlands as well. Navigation can be hampered by surge waves due to unsteady water flow as some power generation units undergo load shedding. This can occur in case where water diversion channels and ship-lock approach channels are in the same canal and can put safety of ships sailing across at risk. Large hydropower dams are associated with huge construction projects that are well known for high fatality rates. In Norway for example, 23 fatalities were registered on the Tokke 1GW project (1956-1974), 3 fatalities on the Ulla FØrre 2GW project . Therefore, safety is also an issue during the implementation phase of hydropower projects. The above issues call for environmentally sensitive technical improvements such as creation of passages for migration of marine species from upstream to downstream and vice versa. This and other measures can minimise environmental impacts of hydropower generation. Urban Kjellen, Managing safety in hydropower projects in emerging markets- experiences in developing from a reactive to a proactive approach. Available at ScienceDirect (Elsevier). Permalink Submitted by Kingsley ENEM on Fri, 2012-11-30 09:09. Generally hydro-power is safe than fossil fuel systems and nuclear as there are no carbon emissions, no waste and no thermal degradation of water. Safety is a fundamental aspect and basic requirement for all operations. Negative impact on human health and safety is reduced through comprehensive safety work and well-established risk management systems. However the hydro-power plants do not require any fossil fuel, it does not produce greenhouse gases and don't generate pollution directly, it does have an amount of disadvantageous effects on the environment. The construction activity of the dam itself disrupts the environment to a great scale. The construction of hydro-power typically involves the alteration of the water at an existing waterfall or the construction of a reservoir. When the course of water is altered the surrounding areas may get flooded troubling natural flora and fauna. People living in these areas also get displaced. Dam safety is an essential aspect of hydro-power, since dam's failure could have serious consequences, causing threat to human life, significant property and environmental damage. The risk of a dam failure is exceedingly small, and current requirements are calculated for water flows that statistically happen every 10,000 years. The safety of dams operations is regulated by a number of different organizations. Since river operations are a main component of dam safety, licensees are required to document compliance with project flows and reservoir operation plan requirements. Permalink Submitted by Aleksandr Poljakov on Mon, 2012-12-03 16:38.
life cycle of the power plant. Structural Design is a core issue. Permalink Submitted by Aleksandr Poljakov on Mon, 2012-12-03 16:40.
withstand water pressures and level happening one every thousand years. Permalink Submitted by Savitha Haneef on Tue, 2012-12-04 10:11. There is no doubt as hydropower is a cleaner source of renewable energy. In the modern world where global warming is a serious issue, hydropower stands out as a reliable and less pollutant energy. Operational safety is not mucha challenge in hydropower.While considering the safety of hydropower generation, dam safety is a serious aspect to be discussed as said in the previous post.A dam failure would result in serious consequences causing a threat to human life and properties. The risk of a dam failure is relatively very low but with the changing climate and rainfall recieved this is not the case.Hence careful & safety design considerations should go in the construction of any dams.The construction and design should respect the existing water course, ecosystem and fish passage.And for maintanence I believe good practises are followed to ensure the safety like regular monitoring of any structural damage and checking of the chemical & physical quality of water to see if there is any accidental splillage of chemicals etc. Permalink Submitted by amir masoud bayat on Tue, 2012-12-04 21:10. The location and nature of Hydro power plants beside externel threats such as natural disaster and terrorists, makes it a high safety threat facility. The physical safety of Hydro power plants is planned to safeguard them in natural disaster. The structure of hydro power plant occupaies big areas og geographical region. There ae several essencial significant components in a Hydro power plants which require focused safety measures. One of the most imortant aspects of Hydro power safety is Dam safety which can cause noticeable property damage and a significant threat to human life. However, the probability of a Dam damage is slim to none. Permalink Submitted by AliasBaby on Wed, 2012-12-05 14:23. Permalink Submitted by Patricia Fleitas on Thu, 2012-12-06 07:05. Looking at the statistics of severe accidents from 1969 to 2000 reported by Burgherr and Hirschuberg (2008), the Hydropower industry represented the energy sector with the highest fatal accidents with immediate causes. Hydropower got 37% of the total worldwide fatalities related with energy-man in the period studied. 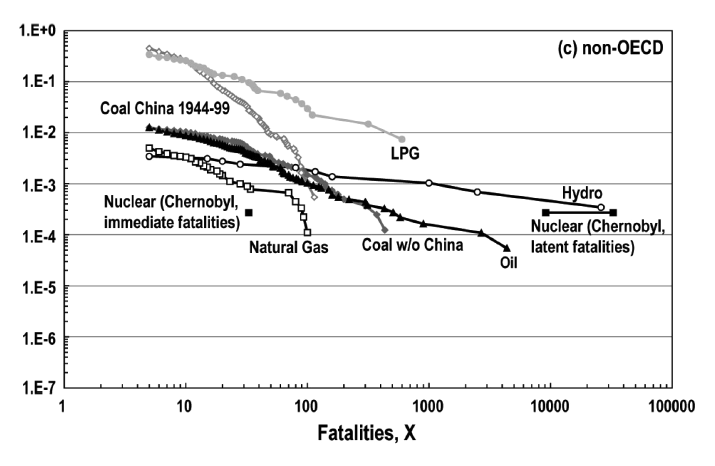 Moreover, analysing the frequency-consequence curve (FN) it can be noticed that the frequency of fatality accidents in Hydropower is lower than Coal, LPG and Oil respect to less than 100 fatalities per event, however when the number of fatalities increase over 1000 death then Hydropower is more probable to occur than Coal or Oil energy-man severe accidents. This statistics give a clear indication about the severe damage that this technology can cause when poor design takes place and take emergency actions over an overflow situation or Dam failure is totally difficult to achieve. The best actions to take is PREVENTION by high designs, monitoring and control, determination of perimeter safety area of the community and release channels of rivers in case of emergency overflow. In the case of environmental concerns such as fish life affection, a good strategy of re-location of fish could reduce the environmental effects. To concluded, I support the hydropower technology because more environmental friendly technology than unconventional oil and gas, but good designs are required. Burgherr P. and Hirschberg S. (2008). “ A comparative analysis of accidents risks in Fossil, Hydro, and nuclear energy chains”. Paul Scherrer Institut (PSI). Switzerland. Permalink Submitted by Edwin Lawrance on Fri, 2012-12-07 16:39.
several views can be seen related to the safety of dams. Is it completely safe? volcano. If something happens it can wipe out a large area within few seconds. for creating new dams must be reduced. Permalink Submitted by Edwin Lawrance on Fri, 2012-12-07 17:30.
designed age limit, several repairs and strengthening measures were conducted. state, proposal for the new dam was rejected. structure? What is important life or irrigation? Permalink Submitted by charlesggeorge on Sat, 2012-12-08 19:36.
of the people first for this reason. in which people living and it will be destroy all the places within seconds. know why government has no key interest to solve this issue. Permalink Submitted by ROHIT NAIR on Sat, 2012-12-08 19:49.
about carrying out investigations to determine the safety of Mullaperiyar Dam. influenced the outcome of this report is questionable. Permalink Submitted by charlesggeorge on Sat, 2012-12-08 20:31.
political people who making laws as well the safety regulations made by them. happens only, there will never bother about the safety issues surrounding it. implement only after when accident happen. have regular inspections to avoid such disasters in future. Permalink Submitted by ROHIT NAIR on Sat, 2012-12-08 20:46.
height of 8-10m flooding the city of Morvi in the Rajkot district of Gujrat, India. Permalink Submitted by ROHIT NAIR on Sat, 2012-12-08 19:56.
stored in the reservoir can be raised from 136 cm to 142 cm. Permalink Submitted by Kelvin Arazu on Fri, 2012-12-07 18:36. A common fact holds that hydro power is safer than fossil fuel systems and nuclear . Since they are no site of air emissions, no waste and no thermal degradation of water is seen in this technology. may not cause problems as the water is eventually released to the same water course. The hydro power reservoir with its associated dams is another case. practicable safety measures and moving settlements away from this site could forestall the effect of this technology. Permalink Submitted by ROHIT NAIR on Sat, 2012-12-08 18:32. Permalink Submitted by SanjayVyas on Sun, 2012-12-09 13:09.
such as floods, earthquake, upstream dam failure, design failure, etc. Permalink Submitted by amaka.ikeaka on Sun, 2012-12-09 16:03.
be decommissioned, and a new dam should be reconstructed. Permalink Submitted by ZHANGYANAN on Mon, 2012-12-10 10:56. Permalink Submitted by Oluwatadegbe Ad... on Mon, 2012-12-10 19:45. Hydroelectricity is a low-carbon, renewable energy source. Increasing the proportion of the UK's electricity generated using low-carbon energy sources can reduce the proportion that must be generated by higher-carbon sources. The working life of a large-scale hydroelectric power station can exceed 100 years, so when the average lifetime emissions of a hydroelectric power station are calculated, initial carbon dioxide (CO2) emissions are offset by subsequent decades of zero-carbon electricity generation. area flooded to make the reservoir. Building a dam may require the removal of trees that help absorb carbon from the atmosphere. When land is cleared for construction, greenhouse gases also escape from the soil and future capacity to absorb carbon is lost too. The carbon footprint involved in making and transporting the concrete used to construct a large-scale hydroelectric power station is significant. Making cement, an ingredient of concrete, releases large quantities of CO2 into the atmosphere. But the working life of a large-scale hydroelectric power station can exceed 100 years, so when the average lifetime emissions of a hydroelectric power station are calculated, these initial CO2 emissions are offset by the subsequent decades of zero-carbon electricity generation. Permalink Submitted by Tilak Suresh Kumar on Mon, 2012-12-10 21:26. Adding to the above discussion here is an extract from the engineering gudielines for the evaluation hydropower project presenting an over veiw of the dam safety monitoring program. • Developing operating procedures to assure that there are no weak links that could lead to mis-operation failures. Permalink Submitted by Mehran Vakil on Mon, 2012-12-10 21:34. However I am advocate of renewable source of energy, but when I have reviewed the previous comments, my attitude towards renewable energies seems to be negative. I become aware that due to Chinese dam (Banqiao) failure, about 180,000 people died(the daily BEAST, 2009). Thus, I commenced searching about hydropower and its drawbacks. I achieved some data about hazard incidents associated with hydropower. BUT, to be fair, from efficiency perspective, being renewable and also not emission of greenhouse gases, hydropower is one of the most significant safe methods in order to producing energy. 1)ANSWER, W. 2012. How is hydro power safe? [Online]. Available: http://wiki.answers.com/Q/How_is_hydro_power_safe [Accessed 27/11 2012]. 2)BEAST, T. D. 2009. Natural Disasters You Never Heard About [Online]. Available: http://www.thedailybeast.com/newsweek/2009/10/06/natural-disasters-you-n... [Accessed 27/11 2012]. 3)FERC. 1992. GUIDELINES FOR PUBLIC SAFETY AT HYDROPOWER PROJECTS [Online]. Available: http://www.ferc.gov/industries/hydropower/safety/guidelines/public-safet... [Accessed 27/11 2012]. Permalink Submitted by Tasie Marshal on Mon, 2012-12-10 23:06.
of lives and communities along the course of river Niger in west Africa.